This recipe is sponsored by Encha. All opinions are mine alone. Over the past few years, I’ve become one of the many people who are obsessed with matcha. I am rather sensitive to caffeine and had to stop drinking coffee on a regular basis because of it. But what blogger can properly function without any caffeine at all?!? So, I started occasionally making matcha drinks like the Copycat Starbucks Matcha Latte. But sometimes even that could be too much. What if I wanted even less caffeine than a matcha latte? 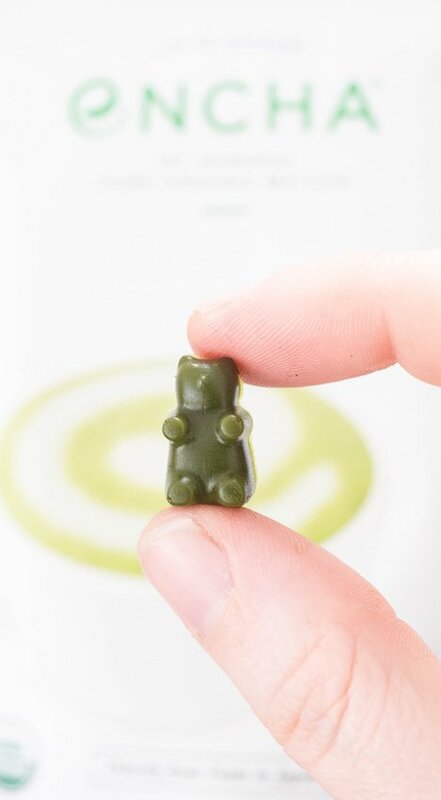 This train of thought led me to create my own matcha gummy bear recipe. To make these matcha gummy bears, I used my favorite brand of matcha, Encha. They are an exclusively organic matcha brand. A few years ago, I was working in pre-production on a documentary about tea. One of the most alarming things I learned was that virtually all tea, even the expensive high-end brands, are covered in pesticides. 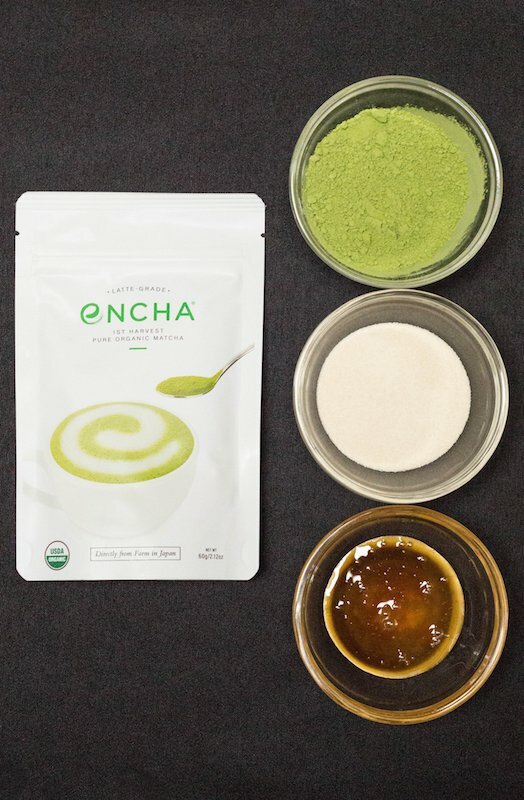 Keeping harmful chemicals out of my body is very important to me, so I was thrilled to find Encha’s organic matcha powder. I have found Encha to have the best taste of any matcha that I’ve tried. 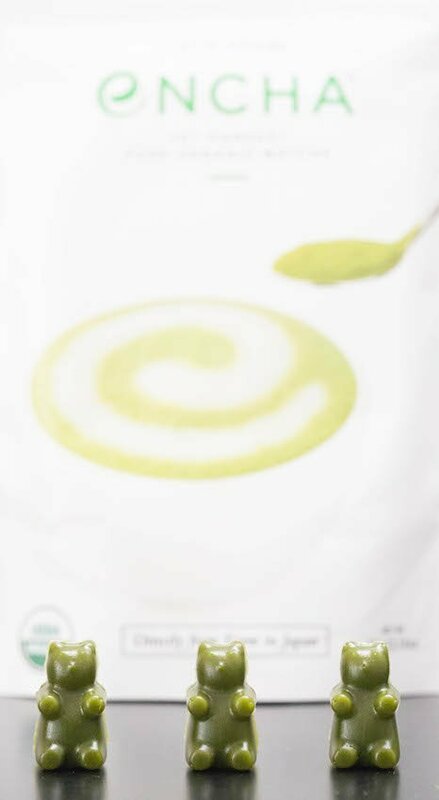 There are no additives or preservatives in their matcha powder, just ground organic tea leaves. At their organic farm in Japan, the matcha is shaded for 3 weeks before harvest, which helps produce extra theanine. Theanine combined with the low levels of caffeine helps give you “Zenergy” – a calm, focused energy that doesn’t result in jitters or a crash. As someone who is sensitive to caffeine, this is exactly what I need! In addition to giving you Zenergy, matcha can also stimulate your metabolism and help with weight management. 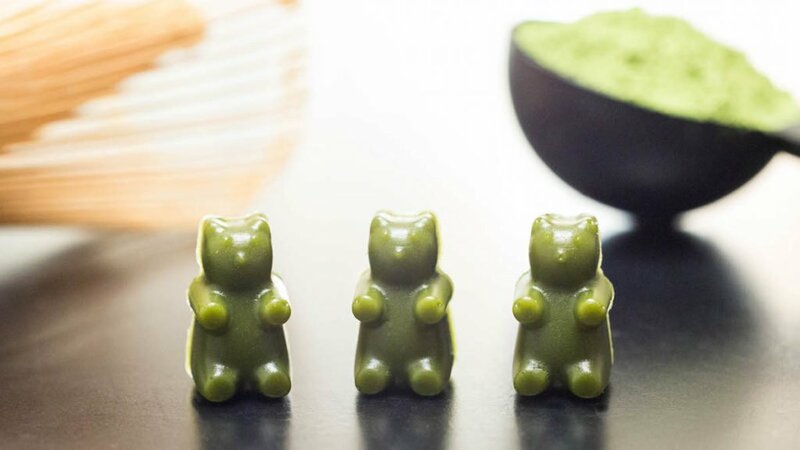 I love eating a handful of these matcha bears in the morning for an energy boost or snacking on a few after lunch to help get me through the rest of the day. I wanted to keep the ingredients minimal, so these bears simply consist of water, matcha, honey, and gelatin. You can substitute the honey with agave or another sweetener of your choice. I have also tested this recipe with Agar, so it can easily be made vegetarian. Eating 25 matcha gummy bears is about the equivalent to one matcha latte. I hope you enjoy getting your daily dose of matcha with these little bears as much as I do! Heat water over medium-high heat, bringing it almost to a boil. Add honey, gelatin, and matcha. Stir vigorously for a few minutes until matcha and gelatin are both completely dissolved. Set three gummy bear molds on top of a baking sheet. Fill molds with an eyedropper, or evenly distribute the liquid between the molds, then use a small spatula to fill in all the cavities and scrape off the excess. Refrigerate for at least 4 hours, or until bears have set. My best friend is a gummy bear fanatic! She would love this what a healthy alternative version! I’ve never made gummy bears! What a cool recipe!! I love matcha and need to try this Encha ! It’s been a long time since I’ve had matcha, but I need to give it another try! Love home made gummies! They look so cute 🙂 I can totally see how it is difficult to eat them! Have to try these sometime. What a great way to get your matcha. There is lots of times whereby I don’t have time to make the tea — this would be a great way to get my matcha. The teddy bears are adorable. This is a fantastic idea! Love the idea of eating little gummies with a caffeine boost and gut healing gelatine! Pinned this for later! Oh my goodness! I have been wanting to make my own gummy bears AND use more matcha! This recipe totally takes care of both! LOVE IT! Oh, I’m very sensitive to caffeine as well. Can’t tolerate it in large amounts. Your matcha gummy bears are just perfect for people like me. I never would have thought to make gummy bears out of matcha, but now that I know you can, I don’t think I could ever have normal gummy bears again!!! So brilliant!!! That’s it?! I can’t believe how simple it is seem to make your own gummy bears! And they look so good and healthy too (I never thought I’d ever use that line in a sentence about gummy bears)! Bookmarked and thanks for sharing! Where do you get gummy bear molds? I LOVE these! Normally I hate the taste of all green tea, but I’ll give these a try. These remind me of the wine gummies that you made about a year ago (maybe more!!!) and I thought that recipe was brilliant. These gummies are next level! I had no clue it was s easy to make gummy bears! I can’t wait to try it myself!